Sometimes I take OOTD pictures and then think “Hmm, this outfit is just not working.” I like the outfits, but they don’t seem complete. Something is missing, but I can’t figure out what exactly would take the outfit to a complete look. I didn’t think the following two outfits deserved an individual post, but I figured you fashionistas could help me figure out how to fix these outfits. If there’s one thing I noticed, both outfits i have my hair up. For some reason, I just don’t care for my hair to be up. I hope that once my hair is longer, I can do some up-dos that are much more fun. 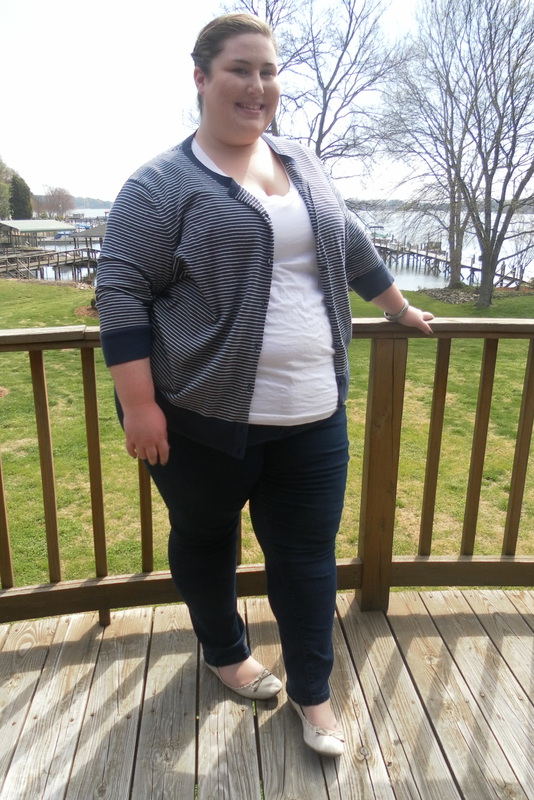 Outfit #1 — I was a bit inspired by the girls who do Five Take’s nautical looks (Here’s Nicole’s post which links to all of the others’), so navy stripes have been calling my name. This outfit is just okay. It’s very basic, which sometimes is exactly what I’m looking for. I got almost all of this at Target: the v-neck pocket tee, striped cardigan, bracelet, and shoes. The jeans are Old Navy. Basic is okay and all, but how can I make this outfit more than basic? So help me out, guys. What can I do to Look #1? Look #2 was for a dinner celebrating my sister’s birthday. 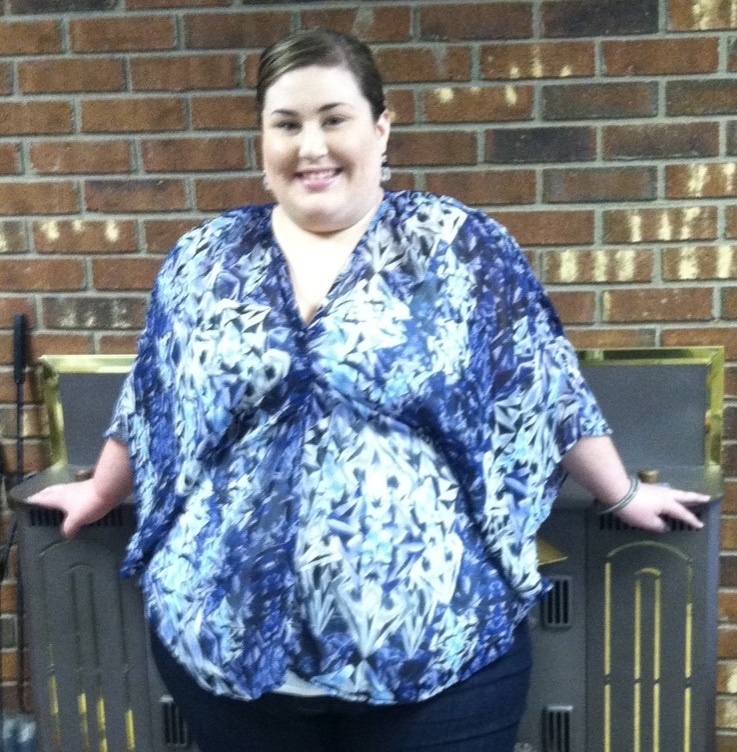 I wanted to wear this top I bought from Torrid last summer, but hadn’t worn before. Prints are something that I’m just now wanting to try out. I’m much more comfortable mixing textures than prints, so that’s why this one has been sitting in my closet for almost a year. It has butterfly wings (or bat wings, whatever ya wanna call it), so a belt is out of the option, although I think a belt could help it. 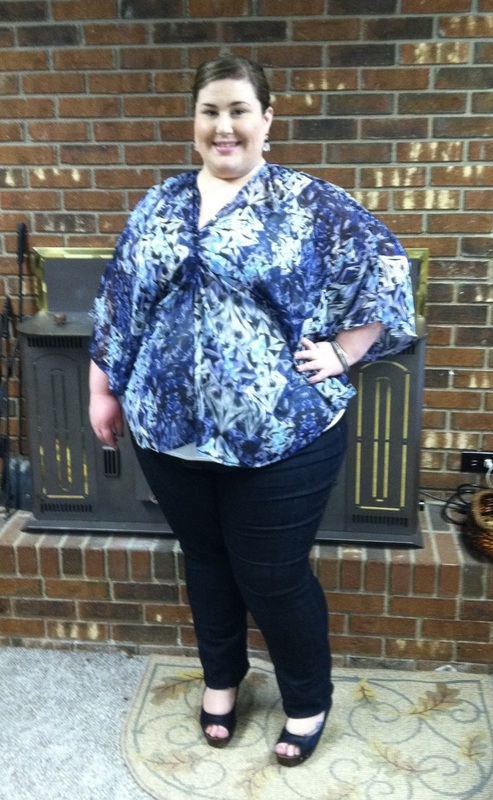 I’m wearing it with my new jeans from City Chic, which have an amazing fit. Maybe if I had worn this with closed-toed shoes I’d like it better.. or with a jacket, but that kind of defeats the purpose of the sleeve. Maybe loose, wavy hair would have done the trick. So again, I ask for your help; how can I make this work? Okay… I live for this. Fixing outfits because I do it to my own posts… regularly. Outfit #1: I would have worn it with a red tank or thrown on a red belt over the sweater & tank and some red shoes. 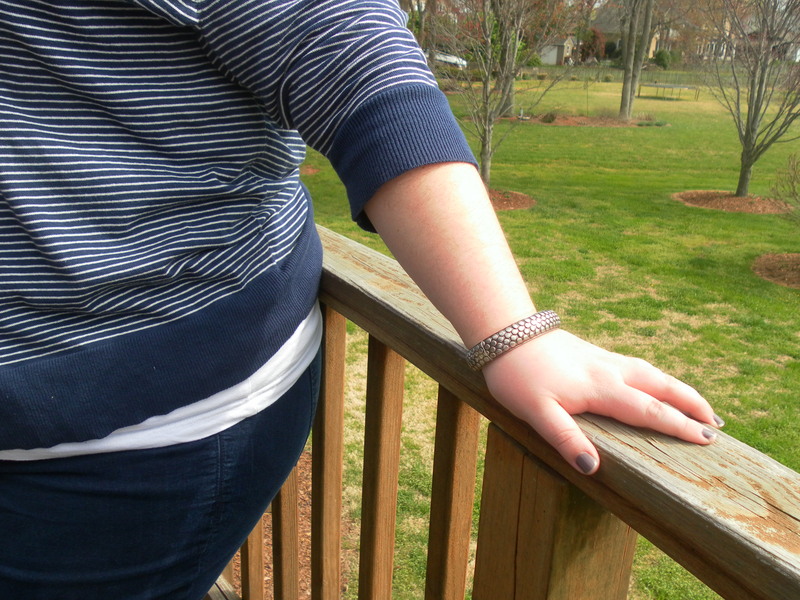 Because blue stripes & red say Nautical to me… don’t know why. Outfit #2: I would have done a pop of color that no one saw coming. Like coral shoes and accessories. Also, I agree… really bold tops seem to work better with your hair down or really dramatic (as in really large) accessories. For your 2nd outfit I’d wear a chunky gold necklace. Really what your outfits need to look “complete” is some chunky/big statement jewelry. 🙂 Pop of colours are nice. I have that same Cardi!!!! Yeah…we are twins, LOL! I agree with Queen Diva, it looks really cute with a red tank or tee. Now my grandmother always had a philosophy that I follow and have always, even though I have not always been the most “fashionable” person because it works, and looking at fashion magazines it proves true 75% of the time. Your beauty glows always, and truly love that about your posts. Even though you deemed these awry, still amazing combos! I am not big fun of tattooes but yours! 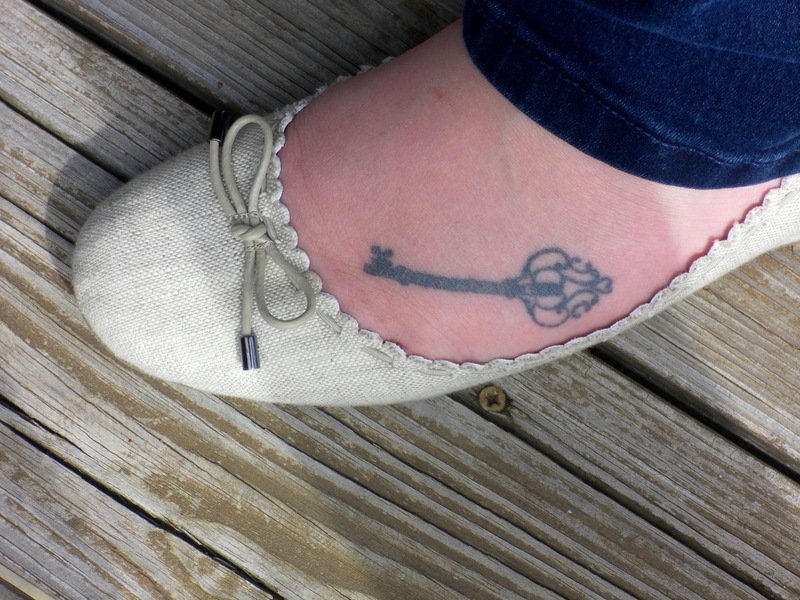 the key on the feet, what an amazing idea!!!! I must agree with QueenDiva. When posting pics, we may not like the look 100%. Even though I challenge myself regularly to go bold, but your chosen outfits are more my comfort level. So I for one like them. I like to wear basics and grade them up with (bright)color or another print. Last I mixed stripes with dots and it kind of worked. So maybe you can try that? I’m also a big fan of accessories: shoes, bags, earrings, big rings, they all complete a look. And last but not least, don’t forget your face/nails. Why not try bright yellow on your nails? Just that pop of color to attract without distracting the whole ensemble. I’m curious what your interpretation of your outfits will be after the comments. I’m sure you’ll do great! Outfit 1: You need a pop of red! I’d’ve put on a red belt and shoes. Outfit 2: Hair down, and a big chunky necklace, maybe some colorful shoes. Seems to be too much blue going on. I know what the first outfit needs! Accessories. It’s simple, chic but a little bare. If you are going for a nautical look, i would go with a pop of red just like the rest. QueenDiva said red tank which I think would make it very nautical but still you need accessories! Hmm I think I would go with a red brooch in a bow shape (okay I know I am specific but i have these images talking to me in my mind) and a red bag and also a red or black beret. I like both of these, but I know exactly what you mean about them being just not complete. With the first outfit, I’d *love* to see the coral shoes and the long necklace from the post you did prior to this. And the second outfit just needs a long necklace (I think you could use the elephant one again) or a simple pair of big hoops! I personally like your hair pulled back- it shows of your gorgeous face!